The speed of any boat is one of the biggest considerations, this is especially true with a pontoon boat. This is because they’re generally not very fast and therefore water sport activities such as towable tubing, and skiing can be difficult. This makes it important to ensure that you identify the speed of a boat before you purchase it, to make sure that the motor can provide you with enough power for your desired activities. In this article, I’ll be explaining the average pontoon boats speed, I’ll be including some examples and some top speeds. Here I’ll be providing you with some examples. These are the speeds at which boat owners claim their boat can top speed at. To acquire these responses, I scanned through boating forums, boat related websites and asked a few real-life connections. Therefore, there may be a slight discrepancy in results by a few mph. 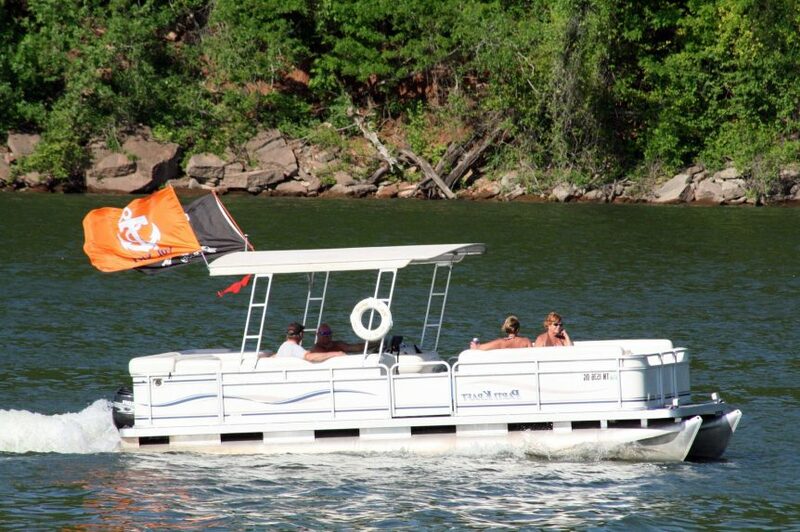 How Fast Does Your Pontoon Need to Go? As I had previously stated, some activities will require you to be able to hit a certain speed. For example, you won’t be able to participate in water-skiing if you can barely hit 15mph. You need to be able to pick up enough speed for the activity to be worth-while. Despite this, you don’t need the fastest pontoon boat on the market to do most water sport activities. Anything over 30mph is unnecessary, as most activities will only require between 13 and 27mph. In this section, I’ll be giving you some examples of optimum average speeds for a few different activities. The average speed for tubing highly depends on the age of the riders and their experience with tubing. If you plan on tubing with kids between the ages of 6 and 12, I’d recommend that you try and stay between the speeds of 14 mph and 20 mph. This is a sufficient amount of speed for tubing with slightly older kids. Whereas, if you’re tubing with any kids under 6, then you don’t want to go any faster than 10 mph. If you’re interested in tubing, I have a whole article in which I talk about the best towable tubes for kids. If you plan on tubing with teens over the age of 13 and adults, then you’ll have to increase the speed slightly. I’d recommend that you try and stay between the speeds of 20 mph and 25 mph. Obviously, teens will be on the lower end of that scale and adults will be at the upper end. You should also take the amount of experience the rider has into consideration. I find that 22 mph is the sweet spot for myself, I can get a good amount of air-time and the speed is more than enough to induce an adrenaline rush. I’d not recommend going any higher than 25 mph, this is when it’s almost impossible to stay inside the tube and can potentially be dangerous. Speed is an important factor in water skiing, as without enough speed – the skier won’t be able to skim the surface of the water smoothly. Also, too much speed will throw them forward, face first into the water. When water skiing, you want to be in the of 15 mph to 36 mph. For more information on water skiing, ThoughtCo have a very informational article in which they analyse the best speed for different variations of Water Skiing. Barefoot is a variation of water-skiing which involves the rider using their bare feet, rather than water skis. This activity requires much higher speeds than water-skiing with water skis. Recommended speeds for barefoot water skiing are between 30 mph and 45 mph. Despite this, barefoot water-skiing is highly dependent on your weight. The heavier you are, the faster you’ll have to go. This is another variation of water-skiing, which involves only using one ski. This is a advanced water sport activity and can be done at a varying speed. I’d recommend anywhere between 15 mph and 36 mph. Obviously, more skilled skiers will be on the higher end, whereas the less experienced will be at the lower end. I think around 25 mph is a good sweet spot. Wakeboarding doesn’t require as much speed as water-skiing does. Most wakeboarders ride at the 15 mph to 20 mph range. Wakeboarding can be dangerous is done at excessively high speeds, therefore it’s recommended to stay between a reasonable speed as previously stated. Wakeboarding is particularly dangerous, more so than most other water sports because both feet are strapped down to a solid board and participants attempt to pull off risky stunts. As you can see, you don’t need to have an ultra-fast boat to participate in any of these activities. This means you don’t need to purchase the fastest and most expensive pontoon on the market. Get yourself an average pontoon and you should be good. 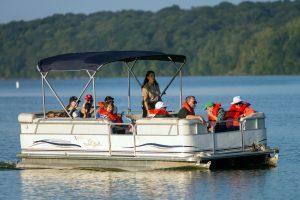 Most pontoon boats will be able provide enough speed for nearly all water sports. On average, you’ll need a boat which is capable of speeds around 25 mph to have fun with water sport activities. How Does Dirty Affect Speed? As I had mentioned previously in my article on how to clean a pontoon boat. It’s important to ensure your boats clean of any barnacles and algae. Not only are they disgusting but they can also affect the speed of your boat. Obviously, they won’t make a tremendous difference – however it’s still a significant speed decrease. I’d estimate that depending on how dirty your boat is, you could lose about 1-5mph. This could cause a 30mph pontoon to become a 25mph pontoon. The heavier your boat is, the more speed it will lose. This is just common sense and it depends on the type of boat you have however there’s no calculation or formula to work out how much speed your boat loses depending on the weight. The addition of riders, equipment and modifications can increase the weight of your boat.